The course is aimed at teachers and managers of lower and upper secondary schools, and intends to provide them with the knowledge and skills necessary to prevent and counteract the phenomena of cyberbullying. If you want to be involved in the experimentation, fill in in the web form. The widespread diffusion and use of new technologies is connected to the phenomenon of cyberbullying, the bullying of others by means of new electronic technologies. Despite the EU Member States launched many initiatives and projects to prevent and combat it, the phenomenon is growing and there is not an organic system of knowledge and skills and structured educational actions for the school teachers. It is necessary that they acquire the competences in order to know cyberbullying’s dynamics, plan appropriate action of prevention, and master the digital technologies to teach the students a correct use of the social media and the online communication tools. 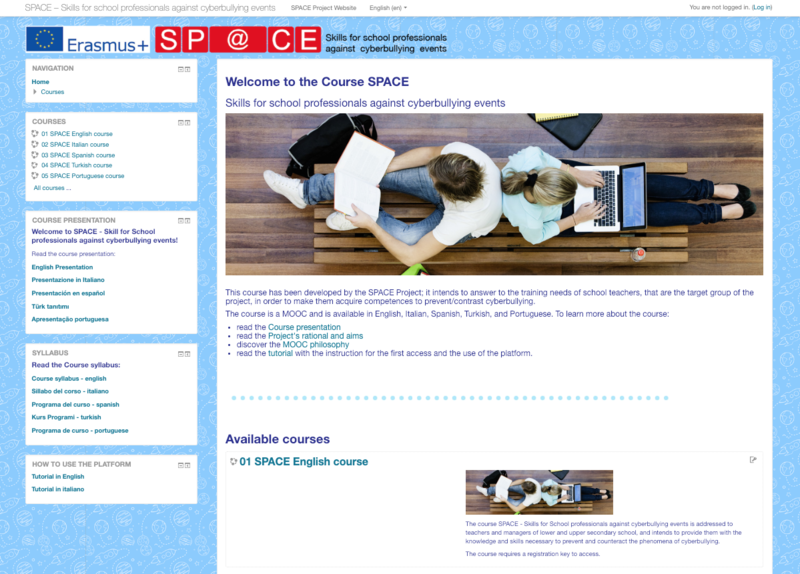 SPACE is a MOOC (Massive Online Open Course), open to all teachers, school managers and anyone interested in acquiring skills to prevent and counter the episodes of cyberbullying. W6. Cyberbullying from the legal side. The units include training content (articles, videos, informative and interactive materials, etc.) and materials for exercises and reflections. The course is based on OER (Open Educational Resources) present in the Internet and developed by institutions, schools, experts and teachers. A knowledge of the main regulations on cyberbullying and the institutions to contact when it occurs. During the period of implementation of the SPACE project, access to the course is limited to participants in the testing. Teachers and managers wishing to take part in the experimental phase can contact the course coordinators. If you want to participate in the MOOC testing, clic here to contact the staff! After the conclusion of the project the course will be open to all without any limitation. Participants in the experimental phase who have completed the activities foreseen in the course will receive a certificate of attendance.